At Bluespoon we always like to leave a small door open to surprise & delight our guests and adjust our dishes based on what is available in our newly planted herb garden & vegetable patch. In doing so, we can involve our guests in tasting what we have carefully nurtured. This ties in suitably with our overall concept of using the freshest local ingredients and giving them a true Bluespoon twist. European flavours with a Dutch edge. That is the motto behind our plates, and as you wander around the Netherlands you don’t need to go far to find that edge. This country sources some of the best produce, which we proudly showcase at the height of their respective seasons. Staying local is key and we often don’t even need to go further than our back garden, as we recently added a herb garden & vegetable patch to our Marcel Wanders-designed oasis. As our weekly selection changes, you’ll find our favourites on your plate ready to be enjoyed – the oyster leaf which originates from Shetland in Scotland and has its name from the after-taste, as well as the violet flower which is as delicious as it is beautiful. This is half of the story behind our new amuse bouche concept. The dining experience at Bluespoon begins with an amuse for every guest, something different every day, but it remains Dutch. 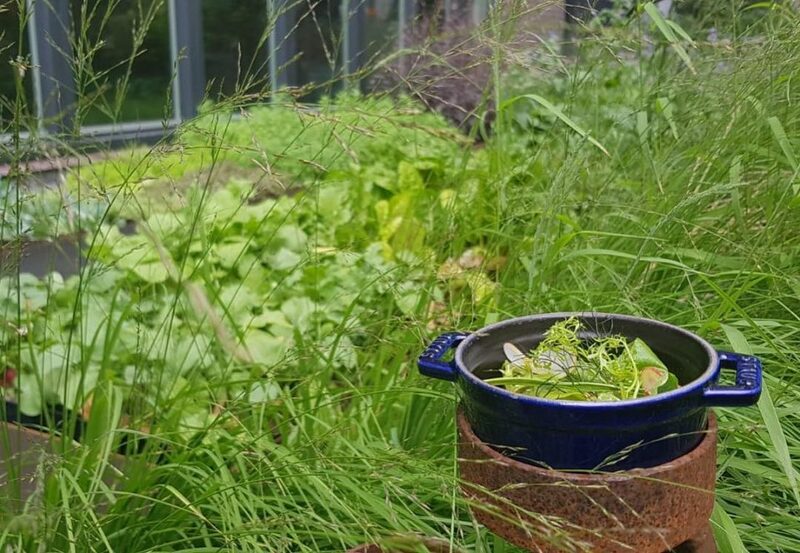 When we have an abundance of produce from our vegetable patch, your flavour senses will prepared for dinner in the shape of a garden leaf salad, which may sound simple, but offers a burst of flavour and what we refer to as a personal trainer for your taste buds. Other times, the amuse is born from an imaginative discussion between the chefs. One of the more recent discussions involved asking the question of what gives a better taste sensation – chocolate or cheese? And the resultant amuse bouche? Not just a chocolate truffle or a piece of cheese, but a Dutch blue cheese and quince chocolate truffle. What a way to amuse the mouth, wouldn’t you agree?